Patients who have diabetes sometimes develop fragile blood vessels in the eye that bleed into the vitreous cavity of the eye causing sudden severe vision loss: vitreous hemorrhage. 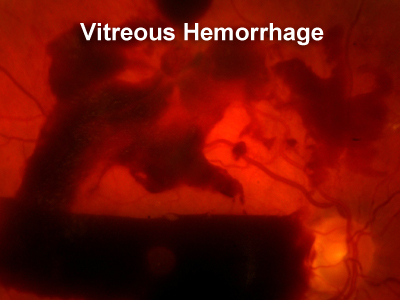 What is a Vitreous Hemorrhage? Vitreous hemorrhage is a sign of advanced diabetic eye disease. "Vitreous" is the jelly-like substance that fills the back of the eye and "hemorrhage" means bleeding into this jelly-like substance. Bleeding in to the back of the eye related to diabetes occurs after growth of significant abnormal blood vessels, which occurs in proliferative diabetic retinopathy. When a vitreous hemorrhage occurs, patients often notice lots of new floaters in the vision. Sometimes these floaters can look like swirls and dots, sometimes they can look like hundreds of "pepper spots," "cigar smoke," or "coffee grounds," and sometimes there can rapidly be darkening or diminishment of vision. The symptoms can be somewhat variable. Although there are often other symptoms in diabetic eye disease that precede vitreous hemorrhage, sometimes vitreous hemorrhage is the first thing a diabetic patient notices. When a vitreous hemorrhage occurs, the eye needs to be examined with a dilated eye exam. Sometimes specialized imaging tests can be used to help analyze the source, severity and extent of the blood. Sometimes an eye ultrasound is performed if the blood is too dense to see the retina behind it. After a complete exam and appropriate imaging of the eye, your doctor will discuss the options for management of the vitreous hemorrhage. How is Vitreous Hemorrhage Managed? Sometimes, a vitreous hemorrhage can be watched, or observed, for a period of time. Observation is the most conservative option. A small vitreous hemorrhage will sometimes be absorbed by the eye. This can take several weeks or months, since the vitreous jelly is very thick and traps the blood within it. If observation is elected, your doctor will want to see you periodically. There are important things to check for, such as worsening of the vitreous hemorrhage or pressure increases in the eye as the hemorrhage moves around. Your doctor may recommend some measures in this period to help the vitreous hemorrhage settle, such as sleeping with the head of the bed elevated, or consider a change in aspirin or anticoagulation use after discussing your case with your general medical doctor or medical specialist. If an observed vitreous hemorrhage clears on its own, the source of the hemorrhage can then be identified and treatment for the source can then be elected. 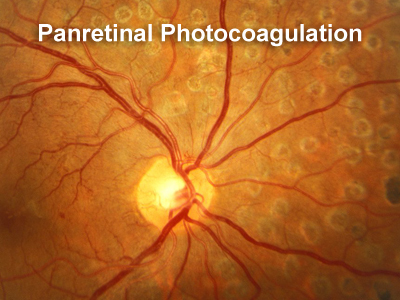 If the retina can be seen behind the vitreous hemorrhage, laser treatment for underlying proliferative diabetic retinopathy, or the source of the hemorrhage, can sometimes be administered. Your doctor will talk with you about whether this is an option depending upon the severity and extent of the hemorrhage. Sometimes, even in denser hemorrhages, injection therapy can be administered to try to affect the source of the bleeding. Treatment with laser or injection therapy through a vitreous hemorrhage is a challenging scenario, and the treatment options in this setting are very individualized. 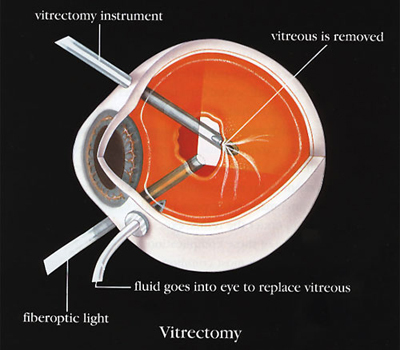 Another option for vitreous hemorrhage is surgical removal in the operating room with diabetic vitrectomy. Often, laser treatment is added in the operating room at the same time. Sometimes, an injection is given a few days before vitretomy surgery to try to reduce bleeding while the surgery is occurring. Vitrectomy is a good option to consider for vitreous hemorrhage in certain scenarios. As with any decision for surgery, it is the most aggressive treatment option, but it is sometimes important to operate so the underlying abnormal blood vessels can be stopped before they become very extensive and scarred. Vitrectomy for vitreous hemorrhage is performed as an outpatient procedure and is often performed under twilight sedation. Surgery has its own specific risks and benefits, which are different from procedures performed in the office, and the timing and option of surgery is also an individual discussion. It is important to be as healthy as possible when going to the operating room to be sedated, so sometimes your retinal surgeon will want to ensure each patient is optimized for surgery by his or her medical team. Following vitrectomy surgery, patients do have some activity restrictions and need to follow-up regularly for the first few weeks. Surgery for vitreous hemorrhage often has a "window of opportunity," and it can usually be scheduled in a fashion for the patient to make work and family arrangements. This case illustraites a surgery for a diabetic with a dense bleed in the vitreous. Toward the end of the surgery, the small 25 gauge cutter becomes blunt and needs to be replaced. The outcome was excellent. 65 Year Old woman with vision loss for almost 2 years. Her vision was light perception when she presented. Her fellow eye had mild proliferative diabetic retinopathy. This eye had a normal ultrasound (except for the vitreous hemorrhage). Her cataract was removed about 2 weeks prior to this surgery. Diabetic vitrectomies have slightly better outcomes if done subsequent to cataract surgery. 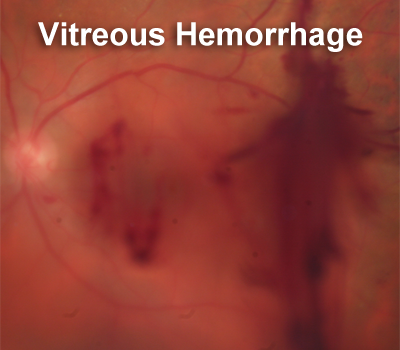 This video shows the dense vitreous hemorrhage looks yellow white.